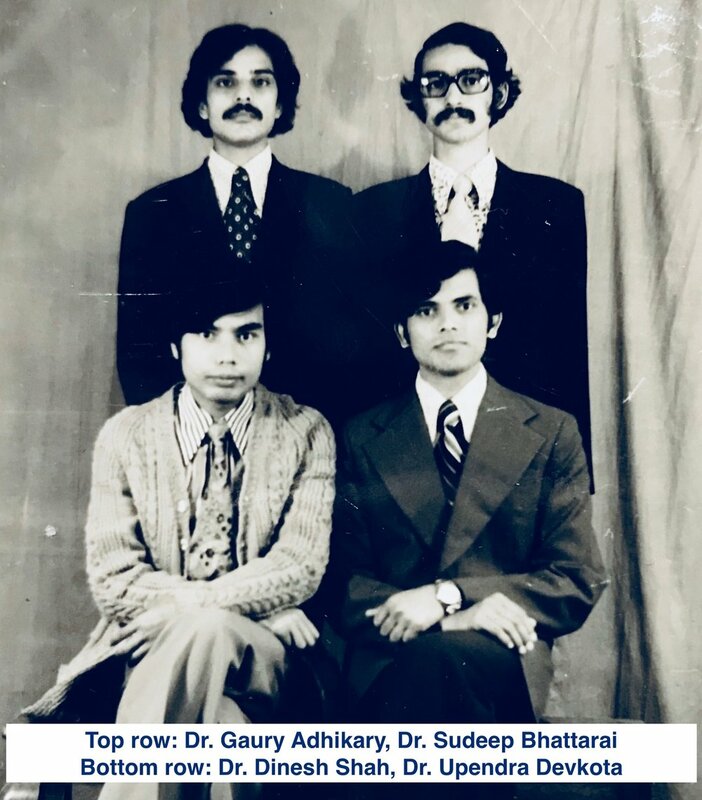 I first met Dr. Upendra Devkota in June of 1972. We had earned a scholarship under the Colombo Plan to study medicine at Assam Medical College, Dibrugarh, Assam, India. During the process of various briefings at the Indian Mission, including medical check-ups, we became acquainted with each other and we quickly became each other’s support system. Both of us were still in our teen years when we flew to Dibrugarh via Calcutta. We arrived at our college in late July 1972. We were admitted on the same day and spent our formative years of basic medical education for the next five and half years together. Since then I have met Upendra on and off in Kathmandu while he was a surgical registrar at Bir Hospital and later in London while he was senior registrar at Atkinson Morley (one of the advanced neurosurgery centers in the world that was instrumental in the development of the CT scan). During my residency days in Plymouth, England, I used to stay with him while I was visiting London. It was my permanent go to place while in London. Later, I kept close contact with him and his lovely wife, Madhu, whenever Anita and I visited Kathmandu on holidays. I have seen him start a unit on the top floor of Bir Hospital, and then advance to opening his own hospital for neurosurgery. Upendra and Madhu gave me the tour of the hospital just before it was opened for service. At the time it was the state of the art hospital in the Kathmandu valley with a CT scan and other latest technology for ICU and OR care. Both Madhu and Upendra were heavily involved in planning the project. In subsequent years, his hospital was recognized as a premier center of excellence for neurosurgical patients. In addition to serving the sick and infirm for many decades, he established a postgraduate training course at his hospital to personally train the future generations of quality neurosurgeons for Nepal. While many of us would have slowed down and been content to enjoy the successes and glories of the days gone by, Upendra was full of energy and going full speed ahead with his plans for the future. Not surprisingly, he was operating on a day he felt weak which prompted a medical checkup. It was then that he received the diagnosis of Cholangiocarcinoma. In spite of best of the treatments, he succumbed to this incurable disease He breathed his last on June 18, 2018, amid loving care of his friends and family. Over the many decades, I observed that this young man I once spent my earlier days at Assam Medical College never wavered from his guiding values of sincerity, accountability, and honesty. He had a sharp sense of analytical thinking, transparency, and courage; this courage was finally put to test as he faced the ultimate fear: death. He was an extraordinary man. Upendra was determined to become a surgeon right from his clinical years in medical school. I must say it was his sheer determination and ambition that drove him to be a good general surgeon. He was a surgical Registrar for 4 years under Dr. Dinesh. N Gongal at Bir Hospital before he traveled to England to train for six grueling years in neurosurgery. He returned to Nepal (as its first neurosurgeon) to prove his mettle and against all odds over the years, he was recognized as a visionary, a great humanitarian and a great surgeon of Nepal. His list of achievements and many milestones in Nepali medical fields are well documented. (See the Wikipedia link below). When one reads his personal account, one is in awe of how on earth this mortal man could surmount so many difficulties to achieve his goal! To me, this truly is a story of a man of grit. Given the backdrop of decades (1990-2010) of Nepali political upheavals compounded with a decade-long near civil war, Royal massacre, and the newly proclaimed Republic in Nepal, anyone else would have become disappointed, paralyzed with despondency and withdraw their efforts. But defeat was not for Dr. Devkota; he pushed right through to manifest his vision during those extraordinary trying times. Unlike other specialties of medicine, neurosurgery is especially difficult to sustain in quality control as a perioperative infectious process can spell utter disaster for any surgical undertaking. In Nepal, this is much more of an issue than in other parts of the world. To overcome such an intractable hindrance, Upendra set up very strict rules to stop the spread of infection by maintaining an impeccable sense of duty on his supporting staff. Visitors were severely restricted to see postoperative patients. For this alone, he earned many an ire from patient’s well-wishers, but he would not care for such misguided distraction; Such was his laser-sharp focus on finding a solution to a problem; the best for the patient was his only motive. He did not care for the adulation from bystanders! I find it difficult to fathom how a friend who was at the peak of his professional career, with many more decades to contribute to and transform Nepal’s health care system, just passed away. His sense of social justice and progressive political ideas was just getting disseminated into rest of the society as evidenced by his recent well thought out interviews to the media. These were widely well received by Nepalis at large. By every standard, he was a well-recognized persona in Nepali society whose potentials were shining like a midday sun. To lose any friend prematurely is hard but to lose such a bright star makes it so much difficult and frustrating. During his career, his wife Dr. Madhu Devkota and their three lovely daughters were the bedrock of his life. Now he is gone for the ages. I wish the family great strength and perseverance, forbearing to overcome the indelible void in their lives. Dr. Upendra Devkota has left a legacy and body of work that is worth emulating. I hope future visionary Nepalis will look to Dr. Devkota as a beacon of hope and inspiration, to overcome their struggles and to achieve the goals and mission of life itself. Wishing peace to my good friend, Upendra, and bon voyage to his next dimension of existence!